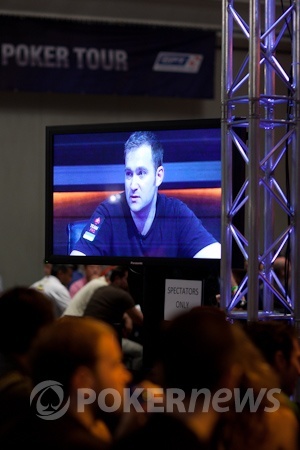 Congratulations to Martin Schleich, 2011 EPT Barcelona Champion (€850,000)! 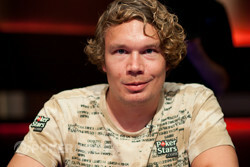 The 2011 PokerStars.com European Poker Tour Barcelona Main Event is all over and emerging victorious is German Martin Schleich with the €850,000 first-place prize. Schleich came into the final table fifth in chips. He battled his way all the way through, but there was a long period of time when everyone watching thought Team PokerStars Pro Eugene Katchalov was going to run away with things. Katchalov began the final table as the shortest stack and was chasing a Triple Crown, but the cards weren't with him today and he was eliminated in third place. When play got down to heads up, Schleich had nearly a two-to-one chip lead over his opponent Dragan Kostic. Heads-up play didn't last too long before Schleich made the last call of an all-in opponent with the . Kostic held the and failed to improve after the board ran out . 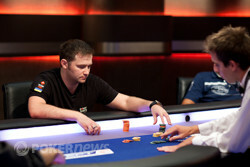 For his runner-up finish, Kostic earned €532,000 while Schleich walked away with the title of 2011 EPT Barcelona champion! Congratulations to all the winners here in Barcelona, Spain and especially to Martin Schleich for becoming the latest EPT victor. Be sure to stay tuned to PokerNews for all further coverage of poker tournaments from around the world including the next stop on the EPT Season 8. We'll see you then! Martin Schleich has opened from the button twice and been shoved on by Dragan Kostic both times recently. The first time around, Schleich folded, but the second time he took a minute and then made the call to put Kostic at risk. Kostic tabled the and was dominated against Schleich's . With Kostic at risk in the hand having the shorter stack, all Schleich had to do was hold up from here and he'd claim the title. The flop came down and Schleich kept the lead with his ace-nine high. The turn brought the and still kept Schleich in front, but Kostic did add a flush draw in clubs with one more card to come. Now Kostic could only hit a club or seven to win the hand. He could also hit a five or deuce to pair the board and force a chopped pot. The river completed the board with the and that missed Kostic. It wound up giving Schleich a pair of nines, but he didn't need it. Schleich was able to win the hand and eliminate Kostic in second place, earning the title and €850,000 for first place. Kostic scored €532,000 for his runner-up finish. Martin Schleich has more than a two-to-one chip lead now after a big pot played out. He raised to 525,000 and then four-bet to 3,400,000 when Dragan Kostic three-bet to 1,500,000. The Spaniard took his time and called to see a flop. Schleich led for a very small 1,500,000 and Kostic called. The turn fell and Schleich moved all-in when Kostic checked to him. Kostic smiled and gave up his hand to drop to a little more than seven million. Martin Schleich won three hands in-a-row. Hand 1. Dragan Kostic raised to 500,000 but folded to a 1,400,000 three-bet from Schleich. Hand 2. Schleich raised to 525,000 and Kostic folded. Hand 3. Kostic limped and Schleich checked before a flop was revealed. The German check-raised Kostic's 250,000 bet up to 800,000. Fold. With the 2011 PokerStars.com European Poker Tour Barcelona Main Event now down to heads-up play, but antes have been removed and the players are just playing with a small blind and large blind as the forced bet. From the button, Martin Schleich raised to 500,000. Dragan Kostic reraised to 1.2 million from the big blind and won the pot. 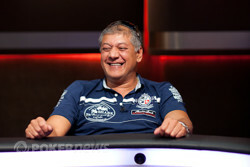 Dragan Kostic won the first hand of heads-up play. He called a 500,000 Martin Schleich button raise to see a flop. Both players checked to the turn where Kostic led for 850,000. Schleich called and called another 850,000 on the river. Kostic tabled and took the pot as his German opponent folded. Three-handed play had to break at some point at it did, finally, after nearly four and-a-half hours of play since Raul Mestre's exit. An exhausted looking Eugene Katchalov three-bet all-in for around 3.3 million from the small blind after a button raise from Martin Schleich. Call. The first card out was and the cheers erupted in the room that was most behind the Ukrainian but they soon turned to gasps as the other two cards were . The board ran out and Katchalov was confirmed bust.